Tofino Fish Guides looks forward to providing a fantastic fishing experience for you and your crew during the 2013 fishing season. We are excited to announce the arrival of our new vessel the "RED SKY" a roomy 27' Pursuit Offshore vessel and our brand new inflatable river fishing kayaks. 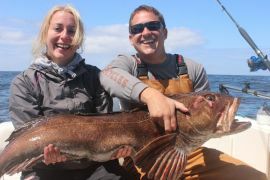 Follow us on Twitter or Like us on Facebook for up to the minute fishing reports and pictures from our latest charters. 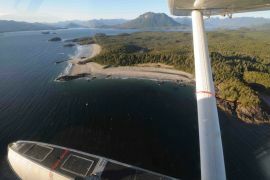 July is a great time to be on the water in Tofino. Fishing for all species has been great as of late, and we look forward to continued success in the coming weeks. Chinook Salmon (Kings) have been biting well Offshore as well as within the Islands of Clayoquot Sound, giving us plenty of uncrowded fishing options. Our first 'Tyee' Chinook Salmon of the year (30+ pound salmon) was caught during the first week of July. 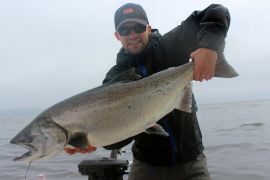 Big Chinook are a thrill to catch, anglers come from around the world during the summer months for a shot at these fish. Coho salmon have shown up in good numbers recently. Coho are perfect for our younger anglers out on a Family Fishing Tour and can be targeted in the calm, protected waters of the Sound. As the summer progresses, Coho salmon give our anglers fantastic sport on the fly rod as we troll or cast around the shallow sandbars and kelp beds. Halibut fishing has been productive this season and new regulations will ensure that the fishery will stay open for the entirety of the fishing season. Halibut between 15 and 60 pounds, great eating size, have been abundant in the Offshore waters. Lingcod and Yellow Eye rock fish can be targeted on the rocky reefs at the northern extent of our fishing grounds. Ground fishing can be highly productive and focuses on hands on jigging. A full day charter is required to fish the best spots, however ground fish can be found closer to Tofino. The river is in prime condition this time of year and is a fantastic place to spend a day drifting in search of Cutthroat Trout. Float down the river in one of our brand new NRS inflatable river kayaks. These safe, stable kayaks are getting rave reviews. Join Lochie MacKenzie a long time fly fishing instructor and a former guide at the prestigious Silver Hilton Steelhead Lodge to learn to cast, or polish up your stroke. Lochie specializes in Spey and overhead techniques. A remote river drift is a great place to take your fly-fishing skills to the next level and hook a few nice trout while your at it! Have a look at our freshwater options. Enjoy a day on our raft or experience the freedom of your own personal watercraft. After three years aboard the "Rye Not" we have upgraded out primary vessel in order to remain on the leading edge of sport fishing vessels available on the west coast of Vancouver Island. The "Red Sky", a Pursuit 255 Offshore, the replacement for the discontinued 2570 line, offers a significant increased interior space, and is equip with the best small vessel electronics available in 2013. The first thing returning guests will notice is the increase in size and comfort of the seats in this vessel. A larger displacement, twin 150HP Yamaha four strokes, a Lowrance electronics package complete with a 12 inch touch screen, structure scan side scanning sonar, and broadband Radar are a few of the other highlights of the "Red Sky". We are sure you will be pleased with this vessel. The "Rye Not" remains in the Tofino fleet and will be available as a second boat through Tofino Fish Guides. More pictures and information. Please feel free to give us a call or shoot us an email if you have further questions or would like to check availability.